Research topic : observation of synthetic biology and living technologies as a way of optimizing biological systems and improving a more sustainable architecture. Formal intent : examining mutational and evolutionary change in plants to generate morphological and emergent structures that underpin natural processes to generate an architectural form. 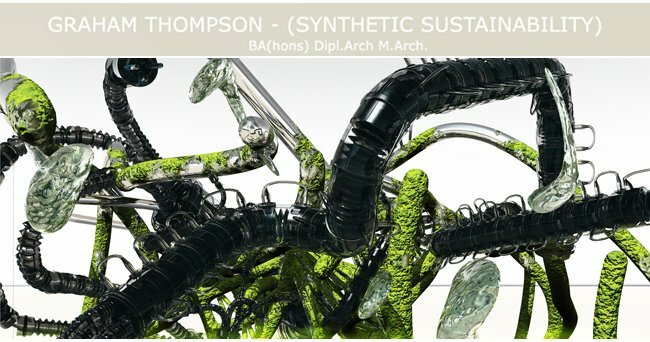 Concentrating on the morphological outcomes which are being used to generate more sustainable architectures by way of drawing inspiration from biological techniques. Scheme : A proposal for a biotech centre containing a biofuel production facility exploring new ways of breeding strains of algae to produce a sustainable biofuel which can be employed into the depleting fossil fuel market. The overall scheme concept is that the centre will be self sustainable by way of producing its own energy, recycling waste so as not to contaminate surrounding water supplies and technologically exacerbate natural resources by way of mechanical, robotic components throughout. Thus creating a predominantly robotically controlled environment agriculture to create a sterile buffer. I have just completed Part II at The Bartlett School of Architecture, Dip.Arch/M.Arch course : Unit 20, tutored by Marcos Cruz and Marjan Colletti. This years focus was centered around convoluted flesh - sublime ecologies, or ecologies of the sublime.